Quite possibly my favorite boat along the Portsmouth, NH waterfront. 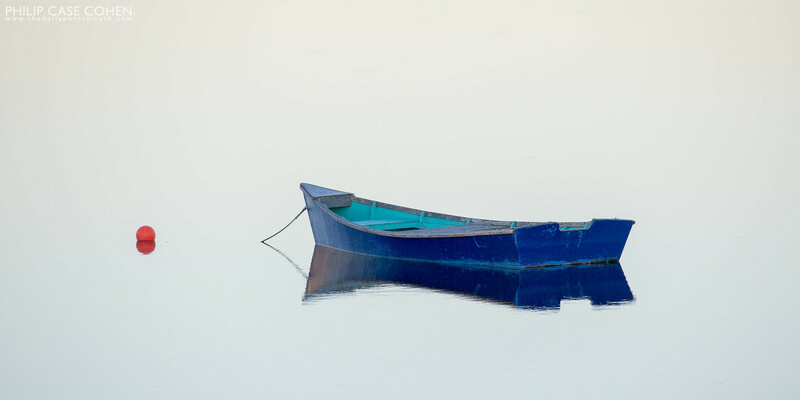 This boat along with a red skiff sat at rest on an early winter morning at high tide just after sunrise. 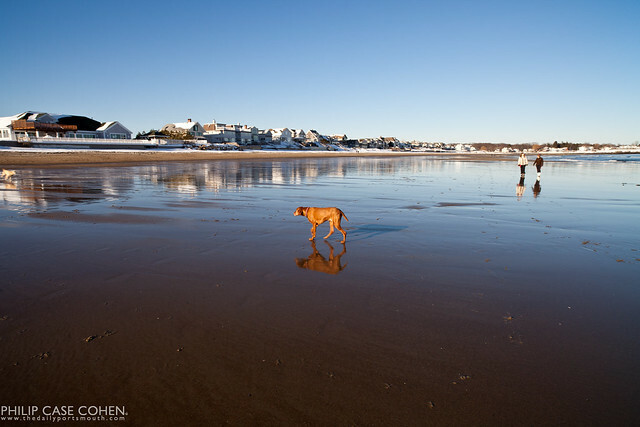 The stillness of the water and the colors of the elements make this one of my favorite images of the year. The late day light and the calmness of the Piscataqua River drew me immediately to this image – which reminded me of an impressionist painting. While this is very far from my ordinary work, it’s also one of my recent favorites and I hope you enjoy it too. Another glimpse of life on the water in Portsmouth. This image was taken from Peirce Island near my favorite boat launch. The low tide allowed me to sneak a bit closer to the water and further from the shore than I usually would…and I’m happy with the results. Another example of why it pays to wake up a bit early. With interesting weather and light, one of my favorite things to do is find a wide open vista to capture all of the grand intricacies. 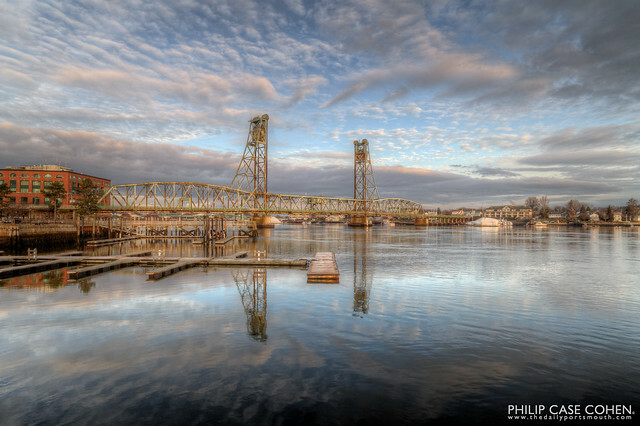 The Memorial Bridge seems a bit more grandiose when it’s sandwiched in between beautiful reflections on the Piscataqua and interesting cloud cover above. The lift span is now up, and has been for more than a week at this point – and I hope to find some inviting conditions to get back and capture a few more images before the span is floated out at the end of January. Evening comes early these days, so I’m looking forward to experimenting with night shooting all over again. 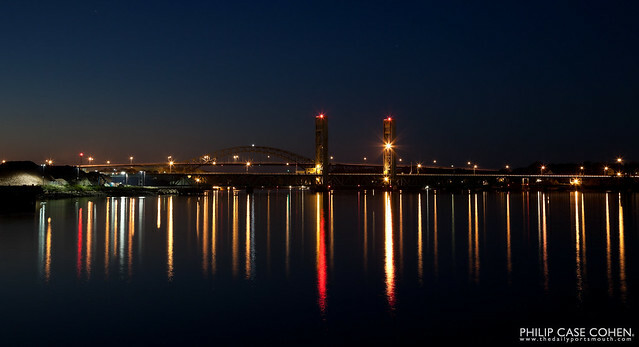 The long shadows of the Middle Bridge reach towards the decks in this night shot, with the salt piles illuminated off to the left. I have much to be thankful for this year – but I wanted to be sure to thank everyone for continuing to support The Daily Portsmouth!! It’s been an amazing year with many twists and turns, and I wouldn’t change a thing. Looking forward to the Holidays and to seeing what next year has in store! Stay tuned for more information on the relocation of The Daily Portsmouth’s office as well as a new collaborative gallery space that I’ll be working on downtown! I hope everyone has a wonderful Thanksgiving holiday with family and friends. Drop a note to let me know what you are thankful for! Today is a very strong image that will always have a special place in my heart. I’ve been visiting the archives lately with my camera being in for repair…and came across the photos from this evening last spring. It will always stand out in my mind, and will always be an amazing gift from my Grandmother Grace. Such intense sunlight and richly textured clouds to capture the incredible color.